Let's talk a little about tolerations. What?! You know, those things we tolerate that cause us stress, frustration, wasted time... those things. I'm getting real here now, and showing you one of my most embarrassing tolerations; laundry basket and suitcase living! This drives me nuts and my husband just shakes his head. I try so hard to put it all away and then little by little I allow it to creep back. Well, I’ve been thinking recently, about how easy it is to be passive - both in our lives and in our creativity. It’s so easy to “put up” with things that no longer serve us instead of changing them. These unnecessary annoyances drain us of energy, impact our mood, and stop us from feeling as fulfilled as we could. Those laundry baskets have been there for months. The one small action of just putting it all away would solve the problem. It would save me time, irritation, and it would take me less time to actually find the clothes I need if I didn't have to dig through a laundry basket! This approach of tolerating minor irritations has carried over into my creating more directly too. For example, I just never sharpen my pencils. That means that most of the time, my choice of pencil is dictated by what still has a point. Crazy, right? I should be in control of which pencils I use in my work. I could open a store with the amount of Stabilos I have...that's a stretch, but you get the point! Another example I have - and I’m sure you can relate to this one, is that I never clean out my paint tubes and bottles. I let them crust over, to the point where I can’t squeeze out any paint (or at least not without gunking up every pair of scissors I own). Instead of prompting me to use different colors, this just prompts me to… buy more paint. Again, it’s crazy. If I took those few moments to clean the openings of my paint bottles, I would spend way less, and take up (slightly) less space with my paint stash. Here's a good one, and I am a bit embarrassed to admit it, but when my memory card gets full (they are all 64GB, which is huge) for some reason I just don't take the time to transfer the files to an external hard drive, freeing up space so I can keep filming. Nope, I purchase another 64GB. That is pretty crazy, I know. Honestly, I barely even notice the things I’m just tolerating now. I’m so used to my habits, that I can’t see where I’ve been holding myself back. You're shaking your head, right?! You have them, too! But I don’t want to let my past actions keep me in a box. I want to clear space in my studio (and in my mind) for creative change. That means looking for my tolerations with new eyes, and taking a stand. Sharpening those pencils (I did buy a new an improved pencil sharpener). Cleaning those paint tubes. 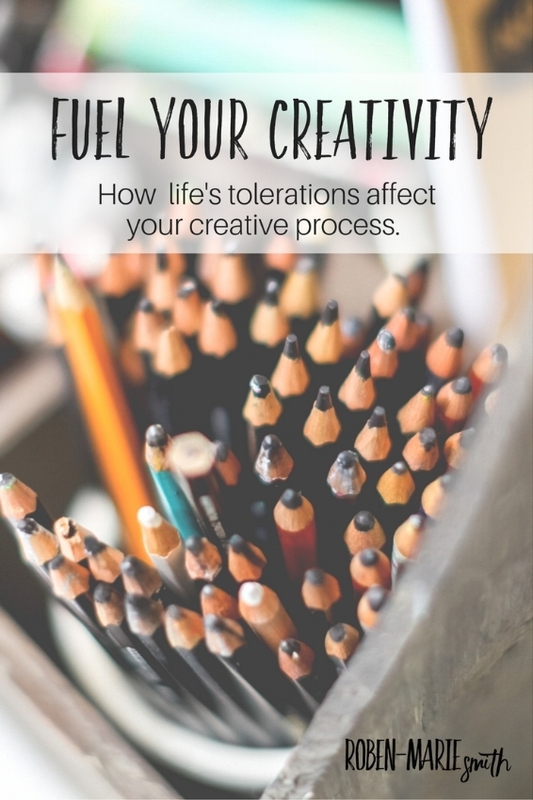 How do you know if you’re being held back by your own tolerations? Do you surround yourself with stacks of unfinished projects, instead of either finishing them or putting them away? Do you keep trying to sketch with pens that are drying up? Do you use 50 paper clips to hold your journal pages in place, instead of 2 strong binder clips? Do you create in semi-darkness, rather than replace that light bulb? Are you using scissors gunked up with washi tape? Are you sulking about a skill you don’t have, despite already purchasing online classes to help you improve? There are many things in this world we must tolerate, but blunt pencils should not be one of them. Tweet That! What tiny tweaks could you do, if you knew they’d fuel your creativity? Leave me a comment below, and share your story. I am off to unload some laundry baskets! Looking for a little help organizing your creative space? Check out my Free Email Course: 10 Ideas to Organize Your Art Space to Maximize Creativity.